Donald Cranor started his career as a trout fishing guide in 1982 at the ripe young age of 15. Growing up on the banks of the White River provided him, at a very young age, with the unique opportunity to learn the White River and the habits of the elusive rainbow and brown trout that call it home. If you were to ask him, Donald couldn't think of doing anything else in life. Becoming one of the top guides in Northern Arkansas has always been Donald's dream. When it comes to catching Big Brown Trout and a lot of them, Donald has been the guide of choice for years. 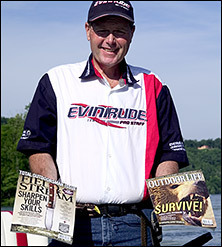 Known around the country from media publications like FIELD and STREAM and OUTDOOR LIFE to TV shows including Byron Velvic's GUIDE EYES seen on Outdoor Channel and a more recent taping with legendary fisherman Bill Dance, Donald Cranor has been the most publicized trout fishing guide in Northern Arkansas for more than ten years. Get in touch and start planning your next trout fishing adventure with Donald!